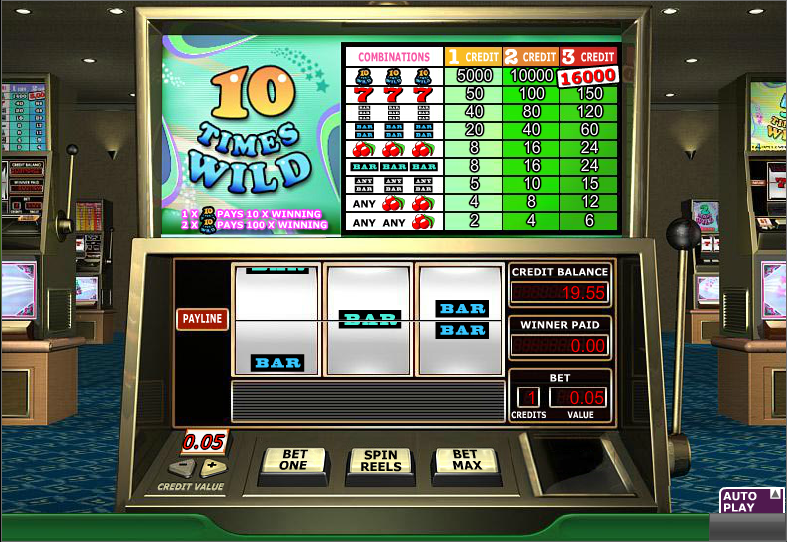 If you’re looking for something realistic to play and are unwilling to leave the comfort of your own home then a classic online slot by Random Logic such as 10 Times Wild might be for you. Perhaps it’s raining outside, maybe it’s cold or maybe the nearest casino is just too far away. Fear not though – 888 Casino has a number of ultra-realistic games which should give you your three reel fix from any location. 10 Times Wild has three reels and just the one payline and it’s designed to make you think you are in a traditional casino; the funky carpeting, the low level lighting and the other slots dotted around the background all add to the atmosphere. Our machine even has a lever to pull to set those reels spinning. There’s a traditional range of symbols including cherries, single, double and triple bars and sevens. The most valuable is the ’10 Times Wild’ symbol which is worth 16000x your stake for three on the payline. Start by selecting your bet using the ‘Credit Value’ button in the bottom left hand corner; then use the ‘Bet One’ or ‘Bet Max’ buttons to multiply your stake if you wish. The paytable above the reels shows how the prizes change as the credits increase. Once you’re happy with your stake, you can press the ‘Spin Reels’ button or click the lever to start those reels off. The 10 Times Wild symbol is quite useful – it acts as a wild symbol and if you can land one as part of a winning combo it will multiply your winnings by 10x. Two in a winning combo will multiply that win by 100x which is not too shabby. Landing one or two cherries will pay out wherever they land on the reels; other symbols pay out from left to right only. This is one of those classic slots which does exactly what is says on the tin; set your stake, pull the lever and watch it go. Well worth checking out if you’re a fan of three reel games.